After living in Washington State for over a decade, September and October have become my favorite months of the year for their spectacular weather, fewer crowds, festivals, fall colors, and scenic fall drives. 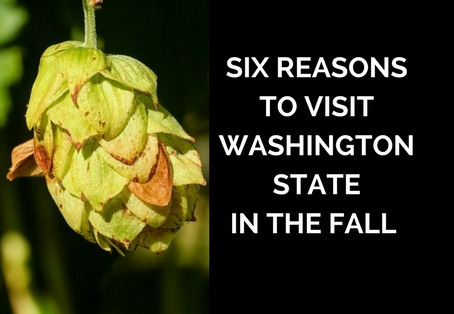 Here are my six reasons to visit Washington State in the fall. I’ve done my share of summertime traveling, and that usually includes waiting in the dreaded ferry line, especially on busy holiday weekends where you can wait through two ferry runs (no this isn’t a joke). 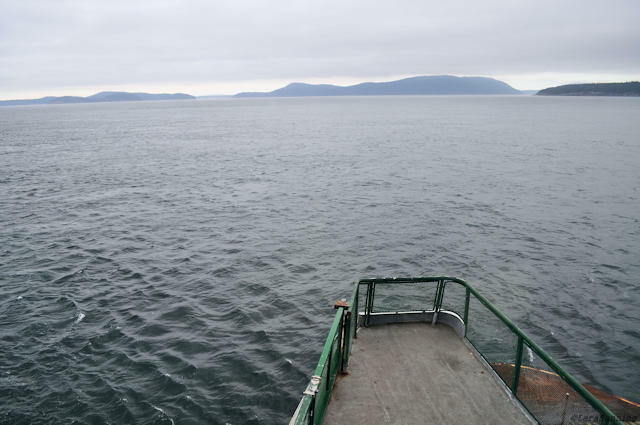 Thankfully, some ferries you can make reservations on like the Port Townsend – Coupeville and the Anacortes – San Juan Islands. In the fall, the lines are not as long, and even on weekends, you most likely will not have to wait. Travel Tip: There are a few reasons you might have to wait and those include game days and holidays like Thanksgiving, a ferry breakdown, or you arrive too late to get in the ferry line (it is always better to be early). Travel Tip: If you are traveling during the summer months, I strongly recommend not procrastinating about making a reservation. Treat yourself when you take up to 70% off on exciting weekend getaways at LivingSocial. One of the reasons it is so nice to travel around Washington in September and October is that school starts in September, and for other areas of the country kids have already been in school since August. What does this mean for travelers? Fewer people on vacation equal fewer crowds almost everywhere you go. Sure, on weekends, you will probably still have to wait in the line at some of the Seattle attractions like the Space Needle or Seattle Great Wheel, but it won’t be near as long. And, if you plan to travel to other areas like Mt. Rainier, the San Juan Islands, or Woodinville for wine tastings you won’t be one in a throng of people trying to have the same experience. Thinking of visiting the island town of Anacortes? Read these travel tips first! Our recent Western Washington summers have been usually sunny and warm, but people often refer to June as Juneuary, and I’ve experienced many a cold June days. While July and August usually have good weather, the crowds make it not so fun to travel, and if you plan to camp, you’ll need to plan in advance. But, by September and usually the first two weeks of October, there are sunny, cooler days with no crowds, which make it ideal for exploring. If you are planning a holiday to the Eastern side, there is plenty of good weather to go around, but in June, July, and August, it can get pretty hot in some areas, and I’m talking triple digit hot. In September and October, and depending on where you are, you can expect the daytime temperatures to be in the 70s, which is very pleasant. Not sure where to go in Eastern Washington? 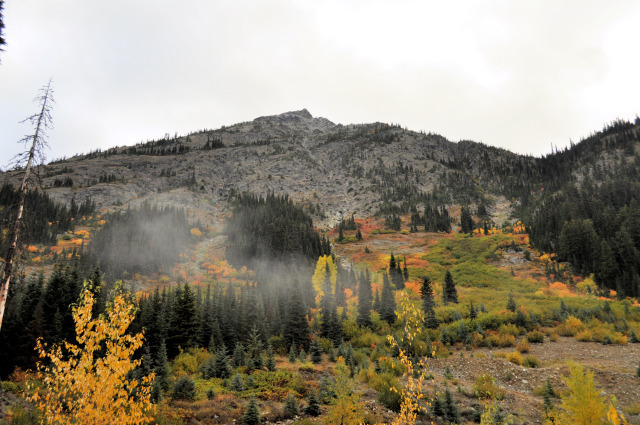 Read about my obsession with Wenatchee! September ushers in the start of the decrease in off-season lodging rates, which is always a good thing on the pocketbook. Sometimes you’ll find as much as a 40 dollar difference, maybe even more in some locations. 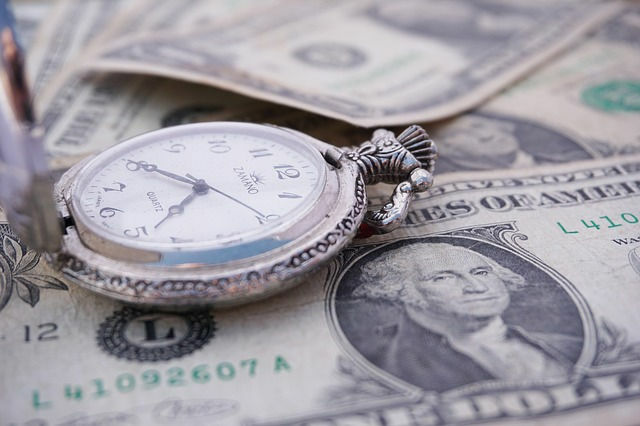 Plus, if your push your dates out for traveling from October through April, the rates are usually even better. Since Western Washington has such a mild winter, traveling during the offseason, makes a lot of sense. If you do decide to travel during the winter months, I suggest bringing an insulated weatherproof jacket and rain shoes. 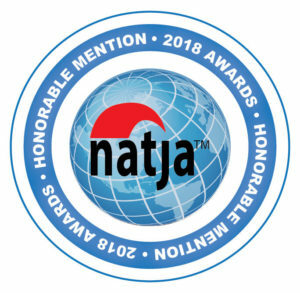 Washington is the second largest producer of wines in the U.S., and throughout the year there are wine tasting opportunities and events. Spring is a big time for wine festivals, but so is fall for this is when harvest and crush begins. All over the state, there will be events in October like the Lake Chelan Crush, harvest parties in Woodinville, and Catch the Crush in Yakima. In November there is Fall Release Weekend in Walla Walla and in the Tri-Cities the Tri-Cities Wine Festival. Interested in seeing more wine events. Here is a list of wine events in Washington State. 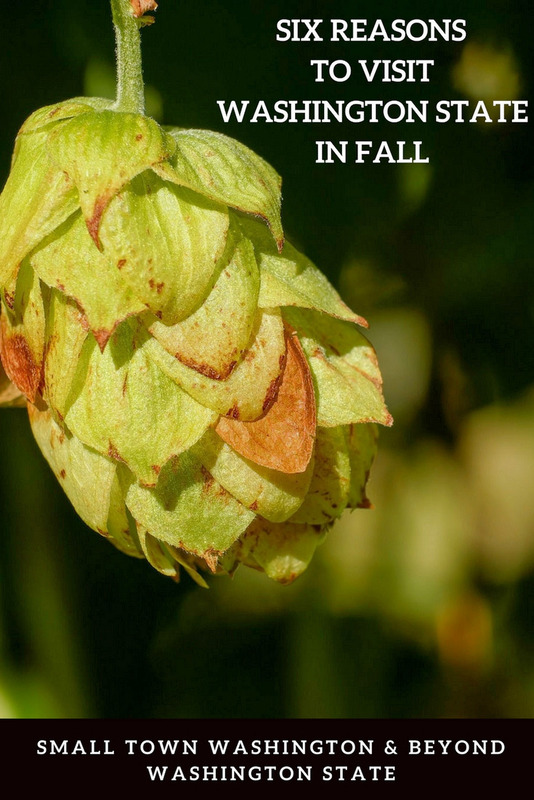 Washington is known for its hops production, and the Yakima Valley grows around 78% of hops in the U.S. Knowing that it shouldn’t be surprising that fall is the time we raise a pint or two and indulge in German food at Oktoberfests. There are plenty all over the state, and some notable ones are Leavenworth’s Oktoberfest, Bier on the Pier in Anacortes, Brew on the Slough in La Conner, Puyallup’s Octoberfest Northwest, and Yakima’s Fresh Hop Ale Festival. Interested in seeing more beer events? Here is a list of beer events in Washington State. If you are partial to ciders, you won’t be disappointed with Washington’s cider scene. There are plenty of ways to sample ciders like the 10-day celebration during Washington Cider Week, Whidbey Island Cider Festival in Coupeville, the Cider Swig in Gig Harbor, and Cider Summit Seattle. Need a gift for a libation lover? Check out these ideas from Washington State. Since living in Washington State, I have become a mushroom lover. 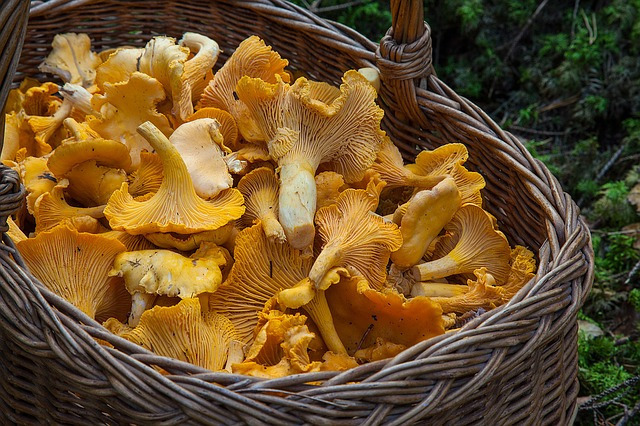 A great place to experience all things mushroom including opportunities to forage, cooking classes, special mushroom menus, and identification, is during the Wild Mushroom Celebration in Long Beach. Many lodgings will have room specials, and restaurants such as [pickled fish] at Adrift Hotel and Spa will have mushroom dishes. Love mushrooms too? Read Mushroom Lovers Make Plans Now for Fall in Long Beach, WA. For more educational-oriented mushroom festivals, there is the Mushroom Festival in Olympic National Park’s and the Wild Mushroom Show in Bellingham. And, lastly, fall colors. Washington state has some highways and roads that meander through the mountains where you’ll see golds, oranges and reds tucked in between evergreen and jagged rocky mountains. Some of my favorite highways are SR 20, US 2, US 97, and US 12. Are you ready for a Pacific Northwest adventure this fall? I LOVELOVELOVE wild mushrooms! Didn’t realize they were so prevalent in WA! I love the idea of visiting in the fall. Was planning for November for the Chocolate Fest. I wonder how the weather would be then? Doreen, Chocolate Fest is perfect for you. November is usually windy and rainy. Tonya, I hope you can convince him! Now I know when to go 🙂 I tis true they are the best months for a lot of places, all great seasons…but you had me at Libation Festivals and mushrooms lol. I’m dying to do a PNW road trip, and I always pictured doing it during the summer. But, maybe I should rethink that. I like the idea of avoiding crowds. Plus these fall festivals sound really fun. I do miss the fall colors…I’m sure they are really gorgeous in Washington. Fall libation festivals…I like the wording of that. 😉 Waiting in a line period…said no one ever. Haha. You’ve convinced me for a year to come back to Washington to see the beauty so I have to make time to fit that in at some point. Washington seems to assume an ethereal sheen in fall. There are so many reasons to experience Washington in the fall. However for me only one reason is enough and that is to experience the blooming colours of fall in Washington. What a lovely makeover nature gives to Washington in the fall. The fall foliage would be a good enough reason for me to visit at that time of the year. I always love to see the Autumn colours, it’s always so pretty. But the fact that there is less crowds, it’s cheaper and you can go to Cider festival and eat lots of wild mushrooms makes it even better! Beautiful photos! Would love to visit to see the autumn leaves, and having less crowds would definitely be a nice bonus! Off seasons are always the best. Less people and more economical. Can’t miss the oranges and reds all along the way. So beautiful. I’m sure I’ll enjoy every minute of it when I’m in Washington. The scenery looks so beautiful and yes, less crowd is good! September was always my favorite month when I was living in Seattle. It wasn’t really rainy yet, and it was still warm. And our family loved going to the Bumbershoot Festival! All the things you mentioned are true. While much of western Washington has evergreen trees, there is still a nice fall foliage scene, too. Tami, Good to hear there is another September Washington fan out there. I’ve never been to Bumbershoot Festival but it sounds like a lot of fun! Not that I needed much convincing, but I’d totally love to visit Washington State in Fall! I’ve been to Seattle only, and during February, but I can only imagine how beautiful it is in September and October. I bet Oktoberfest in Leavenworth is pretty fun, too! Francesca, I haven’t been to Oktoberfest in Leavenworth but I heard it is quite the party.